Up Next: Sean & Jen McCown - the MidnightDBA duo! And who knows? There might even be books for sale at the conference. 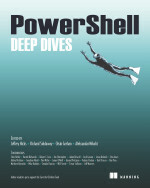 This is the official account for PowerShell.org and sponsor announcements.